Summerville, Christopher. 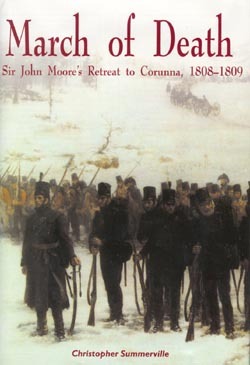 March of Death: Sir John Moore’s Retreat to Corunna, 1808-1809 London: Greenhill Books, 2003. 256 pages. ISBN# 1853675644. Hardcover. $35. In 1808, the Spanish uprising against the French invaders was greeted with great enthusiasm in Great Britain. News of Spanish victories over the previously unbeaten French fueled a belief that the French were on the ropes and that if the Spanish were supported, the French would be ejected from Spain. A decision was made to send the British Army in Portugal, reinforced with an expeditionary force from the British Isles, to support the Spanish. In late October 1808, the British forces marched into Spain filled with high hopes. They expected to find a professional Spanish Army that would co-operate with them against the common enemy and would provide the logistics that would be necessary to sustain the effort. The British were soon faced with a totally different situation than they had envisioned. The Spanish armies were disorganized, badly led, and being defeated on all fronts. Instead of being welcomed with open arms, the British were met with suspicion by their Spanish counterparts and received little support. Despite all of this, General Moore, the British commander ordered his troops to march towards Madrid, to threaten the French flank. Napoleon recognized the threat posed by the British and turned his armies to meet it. Upon hearing the news, General Moore knew that there was nothing he could do to affect the situation in Spain and was determined to save the British Army from destruction. Soon the British began a retreat towards safety in northwest Spain, where they hoped to be evacuated by the Royal Navy. The retreat began well. Although constantly harassed by pursuing French cavalry, the Army kept its discipline and the retreat was orderly. Soon however, a combination of poor logistics and horrendous weather, caused discipline to fail, and much of the army became an undisciplined mob. Thousands died from cold and exposure. By the time the army reached Corunna, where it would be evacuated, it was only a skeleton of its former self. The French Army was pressing hard and before the British could be evacuated they had to fight a final battle. At Corunna, the British, like a fox at bay, turned on their tormentors and severely beat them. The troops then boarded their transports and sailed for home. An ignominious ending for such a proud force. March of Death is the first major study of the Corunna Campaign in English in 35 years. Mr. Summerville brings the campaign to life drawing heavily on English primary sources to describe the initial hopes and optimism of the soldiers, their frustration and disgust with their commander for being ordered to retreat without fighting the French, and then to paint vividly the hardships they endured during the retreat. The real strength of the book lies in its depiction of the horrors of the retreat. For almost two weeks the army struggled over poor roads through some of the most inhospitable terrain in Europe. Compounding their problems was incompetent staff work, a lack of food, little shelter, and cold winter weather that alternated between snow and sleet. Discipline broke and other than the rear guard, many units cease to function. Thousands of soldiers and camp followers fell alongside the road too exhausted or in some cases, too drunk, to go on. The French took prisoner the more fortunate ones, but many others died in a ditch or a field. By the time the army reached its evacuation port (Corunna), it was little more than a rabble. Mr. Summerville puts the reader in the midst of it all and leaves him with a sense of horror at the brutality of the retreat. Yet he also gives credit where credit is due – to those units that never lost their discipline and performed well. The story of the Rear Guard rivals any medieval epic for prodigious feats of valor – for it was through its effort the Army was kept from being destroyed. Although March of Death is the first major study of the Corunna Campaign in almost forty years, there is little new in the book for those who specialize in the Peninsula War. It is a popular history that is very well written and will keep the reader’s interest. I strongly recommend it for those who have not read much on the Peninsula War. It is a great place for further studies!